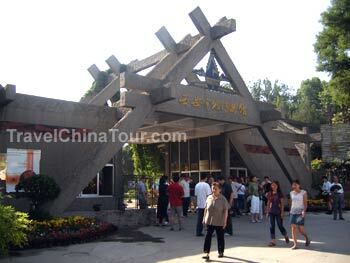 For my 2nd day in Xian, I had planned all the tour locations that are somewhat far out beyond the city's limits, and these include places like Banpo Village, Mausoleum of Emperor QinShiHuang, Terracotta pits, and Huaqing Springs. Instead of dealing with finding my way around all these places I hired a private taxi to take me around. Well if you're ever in Xian and need someone to take you around, you can contact him. His name is Ma Jianjun, and you can get hold of him on his cell at 13992899010. When he came to pick me up in the morning, I was expecting the "regular taxi" ride, but instead, he came in a VW with tinted windows, leather seats, and air conditioning. Early in the morning, I headed to Banpo Village which is about 15 to 20 minute drive east of Xian. The heat today was unbelievable. Early morning (8:30am) and it was already 39 degrees, and by noon, it had reached 43degrees - supposedly a new heat record for Xian. Thank god the car was air conditioned. Once you enter the main entrance, there are display halls on both sides of the courtyard. 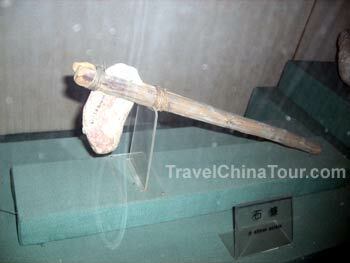 These are items that were choose from the over ten thousand relics excavated at the Banpo site. These include stone axes, painted pottery, carved signs, fishing hooks, farming items, and various articles for everyday use. A stone axe from the excavation site. After visiting these exhibit halls, I climbed some stairs to the main excavation site that's housed in a large building. 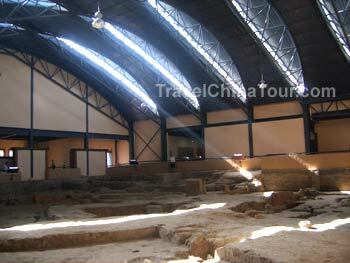 Inside the building, you will see the actual remains of the Banpo village, that dates back about 6,000 years. Pottery was a main art for the Banpo village, and there are 6 kiln discovered at the pottery making center of the remains. Near the entrance you'll also see two fire places. Inside, you'll also see graves of Banpo people that were dug up - one particular one you'll see is a grave for a 3 to 4 year old girl that's buried in a rectangular coffin pit. Inside the excavation site, you'll also see a gigantic pit which was the great moat built along the living area used for defending against invasions. Although only a section of it can be seen, the actual moat is about 500 meters long, 6 to 8 meters wide, and 5 to 6 meters deep. There are also tombs discovered at the site on display. There were two tombs on display where one tomb buried four young women, and another tomb that burried two men. Remains of the 4 young women buried in one tomb. Here's a photo of the remains of 4 young women buried that was discovered at the excavation site. There are also various pottery items that were on display in the tomb. After you finish touring this main building that houses the excavation site, you can exit to an area where you see some weird shaped bulidings with round tops that are replicas representing how houses would've looked 6,000 years ago at the Banpo site. But this area was rather boring, I thought. 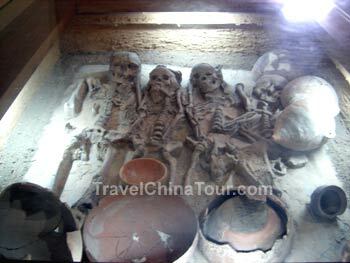 The real stuff with the excavation site, and burial graves with actual preserved bones was much more interesting.